Source: CICH table created using data adapted from Gunby, J., Bissonnette, F., Librach, C., & Cowan., L. (2011). Assisted reproductive technologies (ART) in Canada: 2007 results from the Canadian ART Register. There are three common assisted reproductive technologies (ART): Frozen embryo transfer (FET); invitro fertilization (IVF) with intracytoplasmic sperm injection (ICSI); and invitro fertilization (IVF) with intracytoplasmic sperm injection (ICSI) and oocitye donation (OD). 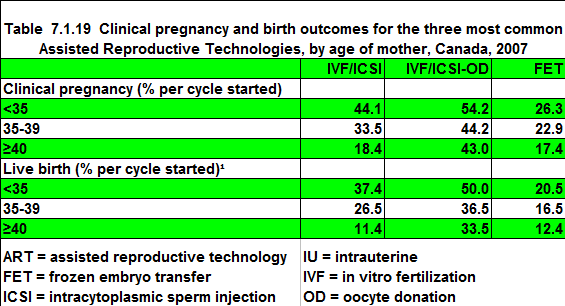 The outcome of these assisted reproductive technologies vary by method and the age of the mother. The likelihood of having a live birth is highest with invitro fertilization (IVF) with intracytoplasmic sperm injection (ICSI) with oocyte donation (OD) among women of all ages.